[AD] Mountain Warehouse Aurora womens down jacket Review – Looking For A Warm Coat This Winter? A warm coat in Winter is one of Life’s essentials! I know so many people who just have a lightweight winter coat because they are in and out of the car all the time. Are you one of those people? Have you ever stopped to think what would happen if that warm cosy car broke down and you were on the side of the road for hours waiting for a recovery vehicle? Do you have a warm coat that you keep you safe and toasty for hours? *This post contains affiliate links – you are not charged for clicking on them/buying through but I may earn a small referral fee. Maybe you are already a winter coat convert. Either way you NEED to know about Mountain Warehouse. We had snow recently and I thought what better time to try my new Mountain Warehouse Aurora Women’s Down Jacket out! As you can see from the photo it was literally freezing outside, but I cannot explain to you how warm I was! My body felt like it was inside sitting next to a log fire not out in the open in the cold! If you need a warm coat, then I definitely recommend Mountain Warehouse. They do ranges for Men, Women & Kids so there is no need for anyone to miss out on being toasty and warm this winter. I reviewed the Aurora Womens Down Padded Jacket in Dark Grey. It is from the Mountain Warehouse Extreme Range. In lab tests it is proven to keep you warm to -60C in active use. It is both waterproof and breathable & comes with a detachable hood. The only downside to this coat is that as it is designed to keep you warm in extreme weathers, it is quite heavy; so definitely not something you would use as an everyday coat. 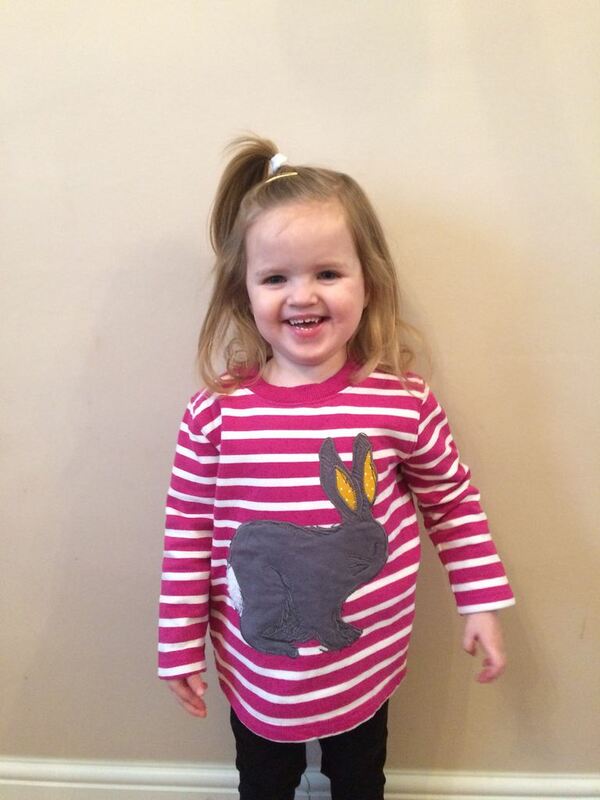 Miss H recently tried a Mountain Warehouse jumper and not only does she love the rabbit pattern on the front, but it also keeps her so warm and cosy. It is so soft and cuddly! Disclaimer: We were provided with the Mountain Warehouse coat & jumper free in exchange for this review. Nonetheless this review is my own honest opinion.